It’s that time of year again. It always seems to creep up on me, no matter how much I think I’m prepared. We had a peaceful start: we set up the Advent tree and wreath, and have even managed to start most mornings off with prayer and lighting the wreath. But I know that even this calm start won’t stop one of my favorite seasons from descending into the typical angst as my ”to do” and “naughty and nice” lists grow and grow. My husband is a teacher and as the semester begins to wind down (with his students’ spirits winding up! ), I know he, too, will find his anxiety beginning to grow. Then the invitations will begin to roll in. And not just for my husband and I, but for several of our thirteen children, many of which are teens still living at home. So how will we find that much needed one-on-one spouse time in the middle of all that manages to invade our lives this time of year? When we were young, eternally broke, and already five children into the game, our favorite go to “date night” was a “car date” in…the driveway! Back then, we lived in a small town about 20 minutes away from my husband’s job in the city. By dinnertime, I was really ready for a break and my husband, having just left the stresses of the city, needed to ease into the chaos of returning to a home with five young children between the ages of nine and one. With only one income, paying a babysitter to go out just wasn’t in the cards. One day I was struck with a brilliant idea, proving once more that necessity (or is it desperation?) is the mother of invention. I called Hugo at work and asked him to grab two coffees from our town’s favorite coffee shop on his way home. In the meantime, I made an easy dinner for the kids and put dessert in the oven. When my husband got home, I set the oldest four up in front of the TV with a DVD (today I’d be putting on Netflix or Hulu). Then I set out their “TV dinners”: PB&J sandwiches and juice boxes. Then I popped the one-year-old into her playpen and slipped my coat on. 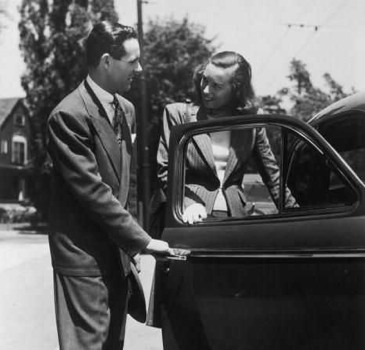 I reminded the oldest, a very mature young lady of nine, that she was only to come to the door and call out to the car if serious issues arose. I then clearly spelled out what a “serious issue” was, quizzing the five- and six-year-old boys on these definitions, since they were most likely to BE the serious issues. When I heard the crunch of Hugo’s tires on the frozen gravel, I snatched up the plate of still-warm brownies and headed to the car. I slid into the front seat and exchanged warm brownies for a fragrant, hot coffee. We chatted for a delectable half hour before we saw a blond set of pigtails waving in the front door window. This was our cue that “driveway date night” was over. Refreshed by having a prolonged, uninterrupted conversation that was not punctuated every 30 seconds with “No!” “Maybe,” “Don’t do that!” and “Stop!” we collected our coffee cups and empty brownie plate and headed in. Today, we have free live-in babysitters, but we still occasionally take advantage of the cheap car date. Now that we have at least one teen available to shepherd and care for the “littles,” sometimes the car date takes place away from home. We’ll drive somewhere and get takeout (or just chips and soda) and sit together in the parking lot eating and watching a movie on one of our smartphones. Regardless of how you manage to spend some one-on-one time with your spouse, numerous studies have shown the importance of investing in your marriage with date nights. Around the world, many organizations are promoting regular face time as a way to strengthen marriages. South Korea and Norway are especially spearheading this idea. Inspired by the movie “Date Night” starring Steve Carell, Norwegian Minister of Children, Solveig Home, said date nights are an excellent way to protect family life for married couples with children. Many groups in the United States, including our Catholic bishops, agree about the importance of date night (see this USCCB page for date night tips). The idea is especially important for couples who are in the throes of raising many young children and who may find it challenging to get quality time away from the house. Misty and Tom, a couple married for 16 years, have five children between the ages of 12 and 1. Tom’s demanding work schedule, the kids’ evening sports activities, and budget constraints have made their “driveway dates” critical for connecting with each other. “It was so easy to get consumed with the demands of family life that we’d go long periods without taking time to really talk to each other,” said Misty. “Driveway dating has changed that. Now, just a half hour together in the car…just talking and listening to each other without all the noise of TV and kids…that time has become a godsend.” While the couple still has the occasional dates out of the house, meeting in the driveway for a special dessert has had a clearly positive impact on their relationship, said Misty. “After we connect, everything about my vocation just seems easier to handle,” she says. So as the month of December marches forward and the stress of trying to make the season special creeps in and tries to take over, make sure you incorporate at least one date night into your routine. It doesn’t have to be fancy; as my experience and Misty’s shows, even just 30 minutes together in the car (with a hot cup of cocoa to stay warm, of course) can truly bless your marriage! Reprinted with permission from CatholicSistas.com. Christi Gareis is a homeschooling mother of thirteen, with eight children still at home. Her youngest child can boast that she was an aunt before she was born. Christi has been blogging since 2005 and has three blogs. In addition to blogging, Christi has been published on Catholicmom.com as well as in CCL’s magazine Family Foundations. She also wrote the section on How to ‘Prepare Your Child for First Reconciliation’ in the book '101 Stories of Reconciliation' by Sister Patricia Proctor.